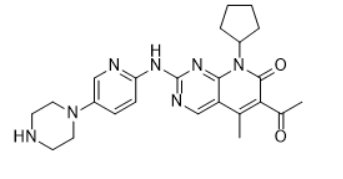 Palbociclib, also known as PD-0332991, is an orally available cyclin-dependent kinase (CDK) inhibitor with potential antineoplastic activity. Palbociclib selectively inhibits cyclin-dependent kinase 4 (CDK4) and 6 (CDK6), thereby inhibiting retinoblastoma (Rb) protein phosphorylation early in the G1 phase leading to cell cycle arrest. This suppresses DNA replication and decreases tumor cell proliferation. CDK4 and 6 are serine/threonine kinases that are upregulated in many tumor cell types and play a key role in the regulation of cell cycle progression. Palbociclib, was approved on February 3, 2015 as a treatment (in combination with letrozole) for patients with estrogen receptor-positive advanced breast cancer. Synonyms:PD-0332991; PD 0332991; PD0332991; Palbociclib free base, brand name: Ibrance. Storage Condition: Dry, dark and at 0 - 4o for short term (days to weeks) or -20oC for long term (months to years).